Very Good. No Jacket. Size: 19 to 25 cm tall, Octavo, (8vo); Illustrated with colour plates. 415 pages. 1st class post to the UK, Airmail worldwide. Robust packaging. Very Good. 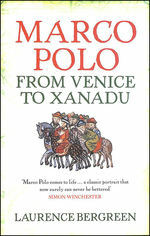 Marco Polo: From Venice to Xanadu by Bergreen, Laurence, 2008-11-01. Trade paperback (US). Glued binding. 415 p. Contains: Illustrations, black & white, Illustrations, color, Maps. "It must be known, then, that from the creation of Adam to the present day, no man, wherher Pagan, or Saracen, or Christian, ot other, of whatever progeny or eeneration he may have been, ever saw or inquired into so many and such great things as Marco Polo above mentioned." Nevertheless, Polo also emerges as an endearing person in this book, which, I think is far more interesting than some of the other works about him which I have seen. Polo was way ahead of his times in many respects. Amongst other things, he took a keen interest in the sexual habits of the people wherever he found himself on his travels. This biography is a reminder of Polo's ability to see things which often elude the attention of visitors to distant lands. His memoirs made him more famous than his father Niccolo and his uncle Maffeo. When the brothers took Marco with them to China, they could never have imagined the welcome the younger Polo would receive at Kublai Khan's court. But I do think that the two senior Polos deserve more recognition than they generally get, and that Marco's memoirs have eclipsed their own achievements. Without them, Marco would probably never have made it to China or the East. Bergreen's book is a delightful, scholarly and thought-provoking biographical appraisal of Marco Polo's life, work and achievements. He may have been an extraordinary braggart, but he was also an extraordinary envoy, for Venice and later for the Great Khan, as he always calls Kublai in his travelogue (William Marsden translation). 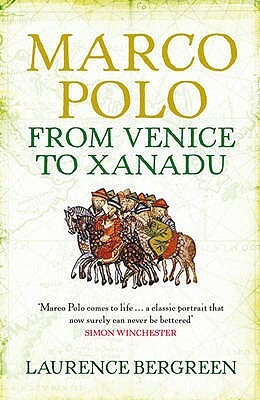 I would recommend this book to all his fans and to everyone who has enjoyed reading The Travels of Marco Polo. A terrific story about life in Europe and Asia during the 13th century. A well written and easy to enjoy volume filling in some of the blanks I had not known in history. This rendering of life under Kublai Kahn differs greatly from what I was taught throughout my schooling. The reader is offered vivid insights into early Chinese / Mongol life. I highly reccomend this read to anyone who enjoys well written history reported as accurately as possible.